Nobody should be surprised that spy satellites are kept secret. But it's actually more complicated. The launches are aired, but with scheduled media blackouts. We get mission patches, but no details on the nature of the payload. But the weirdest thing is how easy it is to track these satellites. The lack of secrecy around spy satellites isn't a choice, but more a basic consequence of the nature of reality. To start with, rocket launches are really bloody obvious. When thousands of pounds of thrust fires off and blazes across the sky, everyone notices. The National Reconnaissance Office bows to the inevitable and does us the courtesy of publicly releasing the times and locations of launches in advance instead of trying to pretend we won't notice. They aren't entirely open with the launch information: we rarely know anything about the duration of a launch window, which limits our ability to piece together where in orbit the rocket is attempting to deliver its payload. Yet even the extremely limited information of where a satellite is launching from is enough to give us some pretty hefty hints about its purpose. For satellites destined to near-Earth orbits, the launch location tells us exactly what type of orbit it is aiming for. Anything launching east out of Florida is heading into an equatorial orbit, while anything boosted south out of California is going into a polar orbit. While equatorial orbits can slip a satellite into geosynchronous positioning for continuous monitoring, a polar orbit is sun-synchronous, passing over the same place at the same time of day, everyday. We also know from the size of the rocket the maximum mass of the payload, while visual examination of the payload shroud can give us a bit of a, "larger than a breadbox, yet smaller than a school bus" sense of size. Live-broadcasting the launches is a relatively recent increase in transparency — but even then we run into a media blackout the moment the aerodynamic protective casings peel off after leaving the atmosphere, exposing the payload. 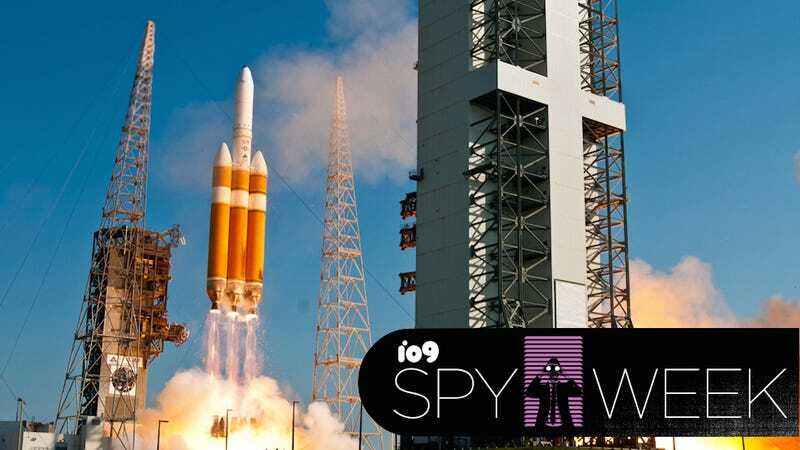 Even though the payloads are secret and the technology is classified for decades, it doesn't take much logic to work out that any technology actively in use on a scientific research satellite could very easily be on a spy satellite. Between visible light, infrared, and radar observations, any time we marvel over the high-resolution datasets available for scientific research, we can uneasily acknowledge that the intelligence trade has access to equal or better quality images for their own projects, and that the technology is going to just keep getting better. The same holds true for signal tracking and communications relay — as coverage keeps expanding to more remote locations, know that the civilian market is behind the cutting edge. Once a satellite is in orbit, intelligence agencies run into the next insurmountable obstacle to secrecy: space is transparent. Depending on how big it is, what it's made of, and its orbit, every single satellite is naked-eye visible. With enough methodical patience and even a low-powered telescope, even the darkest, dimmest, and strangest-shaped satellite isn't going to be able to hide forever. Every time a new satellite is launched, satellite trackers around the world immediately start scouring the horizons along its probable trajectory to find it, then track every move it makes. Spotting satellites poses no great technical challenge: go outside at night, look up, and watch the tiny streaks of artificial stars racing around our planet. For many satellites, you can even look up the orbital parameters to know exactly where and when a specific satellite will be visible from your location. The operators of spy satellites try to keep those orbital parameters hidden, but in practice this just means hobbyist observers compete to track new satellites and orbital changes in existing satellites as a nightly challenge. As for governments, they have serious resources to devote to tracking spy satellites from competing agencies, which makes trying to hide anything even more futile. Pentagon Mitex Satellites Are the First to Actively Spy... On Other Satellites! What does tracking the satellites and determining their orbital parameters tell us? Exactly where and when a satellite will be overhead. This can be downright frustrating for intelligence agencies — the 1998 Indian nuclear tests in the Rajasthan desert were deliberately timed to hide from American spy satellites! The inverse also happens, with displays of force marched out to be "accidentally" discovered. While it all feels very Cold War obsolete on occasion, the simple truth is that every country with satellites in orbit is spying, and every country those satellites pass over knows that it's happening. Because rockets are obvious and space is transparent, not only do we know about these satellites, but they know that we know, and we know that they know we know. Just about the only thing we don't know is what these intelligence organizations choose to do with what they learn.